Windows 7 becomes end of life on the 14 January 2020. This means there will no longer be any new security patches and updates. The risk of viruses, malware and related issues is massively increased because of this – which could directly put your business at risk. Cyber criminals who find further loopholes or weaknesses to exploit will have freedom to use this, knowing Microsoft will not roll out any fixes to those issues. According to official figures, Windows 7 will still be running on 36% of all Windows computers at this date. 3rd Party vendors will also stop releasing updates or providing support for operating systems that Microsoft no longer support. This is a huge number of computers still running a system that presents a risk for their entire business. Upgrading Windows 7 to Windows 10 is quite a painless task. The licence can be upgraded directly on the PC requiring the upgrade, there is an article on how to complete that task here. Replacing the computer with a new Windows 10 device. Not only will you benefit from the latest operating system but also hardware that will perform better: faster memory, quicker processors and most often Solid State Drives which will be so much quicker than the old hard drive you had. Whichever course of action you need to take – you need to plan for this in the coming 12 months! Leaving it past the end date is leaving your business open to real risks. It’s not just Windows 7! A few other Microsoft programs are also being retired on this date – so if your business uses any of these the time to replace is now. 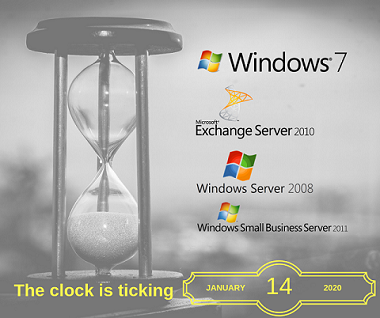 Windows Server 2008 and Exchange Server 2010 are included within SBS2011.